Human Cytomegalovirus (HCMV) has acquired through evolution a number of genes to try to evade immune recognition of the virus-infected cell. Many of these mechanisms act to inhibit the MHC class I antigen presentation pathway, but any virus-infected cell which has down-regulated cell surface expression of MHC class I proteins, to avoid CTL attack, would be expected to become susceptible to lysis by Natural Killer cells. Surprisingly, however, HCMV infected fibroblasts were found to be resistant to NK cell mediated cytotoxicity. Expression of the UL16 glycoprotein could represent one mechanism to help the virus to escape from NK cell attack, as it has been shown to bind, in vitro, some of the ligands for NKG2D, the NK cell activating receptor. Here, we explored the role of UL16, in the context of a viral infection, by comparing the susceptibility to NK lysis of cells infected with HCMV and cells infected with a UL16 deletion mutant of this virus. Cells infected with the UL16 knockout virus were killed at substantially higher levels than cells infected with the wild-type virus. This increased killing could be correlated with a UL16-dependent reduction in surface expression of ligands for the NK cell activating receptor NKG2D. Expression of the UL16 glycoprotein was associated with protection of HCMV-infected cells from NK cell attack. This observation could be correlated with the downregulation of cell surface expression of NKG2D ligands. These data represent a first step towards understanding the mechanism(s) of action of the UL16 protein. Cytomegaloviruses (CMVs) are members of the β subgroup of the Herpesvirus family. Cytomegalovirus infection can be associated with severe, even fatal disease, but in the immunocompetent host, primary infection with CMV is normally controlled by the immune system. This immune control does not result in complete elimination of the virus. Instead, the virus persists for the lifetime of the host with occasional episodes of virus reactivation and shedding. One aspect of CMV biology that almost certainly contributes to this state of permanent cohabitation is that CMVs have acquired during their evolution an extensive repertoire of gene products that can function to modulate immune recognition of the virus and virus-infected cell. Human cytomegalovirus (HCMV), for example, encodes genes whose protein products are able to modulate or inhibit the action of virtually all the arms of the antiviral immune response, ie. interference with the presentation of viral antigens to CTLs, manipulation of cytokine responses, intervention on NK cell cytotoxicity and complement response (reviewed in [1, 2]). The MHC class I restricted antigen presentation pathway is a particular target for HCMV immune subversion strategies, presumably because MHC class I restricted CD8+ cytotoxic T lymphocytes are critical effectors in the host defence against CMV infection [3–5]. However, other things being equal, a decrease in cell surface expression of MHC class I molecules should render the virus-infected cell susceptible to attack by Natural Killer cells; the "missing-self" hypothesis . It is thus not surprising that HCMV has evolved strategies for escaping and/or reducing NK cell immune surveillance. To date, three potential viral immune subversion mechanisms have been suggested to be employed by HCMV directed at NK cells. Two of these involve the induction of expression of decoy ligands able to bind NK cell inhibitory receptors. The first of these ligands, the virus-encoded MHC class I homologue UL18 can interact directly with the ILT2 (CD85j) inhibitory receptor [7, 8]. The second involves an indirect mechanism, as a peptide from the HCMV UL40 protein is able to bind to the non-classical class I molecule HLA-E promoting its surface expression. The interaction of this MHC complex with the CD94/NKG2A heterodimer could inhibit NK cells [9, 10]. The third proposed mechanism by which HCMV could evade NK cell attack depends on the ability of the UL16 glycoprotein to bind ligands of the NK cell activating receptor NKG2D . Indeed, soluble recombinant UL16 protein has been shown to compete with NKG2D for binding to its ligands and so inhibit NK cell activation. However, the significance of these potential immune evasion strategies is not clear. Only a subset of NK cells express ILT2; moreover, antibody blocking of inhibitory receptors such as KIR, CD94/NKG2A or ILT2 had no effect on NK lysis of HCMV infected fibroblasts [12, 13]. Further, there are a number of cases in which the results obtained in experiments with viral proteins expressed in isolation are not consistent with those derived from experiments studying the role of these proteins during virus infection. For example, UL18 expression did not protect HCMV-infected cells from NK cell attack . Experiments testing for UL40-mediated protection from NK cell attack revealed that cells over-expressing HLA-E loaded with UL40 leader sequence peptide were protected from NK lysis [9, 10] and that this effect required a threshold level of HLA-E ; on the other hand, in a viral infection context, NK cytotoxicity protection mediated by UL40  could not be reproduced by other researchers . It is therefore critically important to study the role of potential immunomodulatory viral proteins in the context of the virus infection to establish the degree of their contribution, if any, to immune subversion. Thus, to evaluate the function of UL16, if any, during HCMV infection, we performed cytotoxicity assays to compare the susceptibility to NK lysis of cells infected with HCMV, strain AD169, and cells infected with a UL16 deletion mutant of this virus (ΔUL16) . Cells infected with the virus lacking UL16 expression were markedly more susceptible to NK lysis than cells infected with wild type virus. This difference correlated with the observation that cells infected with the HCMV UL16 knockout expressed ligands for NKG2D that were not expressed at the surface of cells infected with a virus with an intact copy of the UL16 gene. These data demonstrate a direct role for UL16 in modulating the susceptibility of HCMV infected cells to lysis by NK cells. It has previously been reported that infection of fibroblasts with HCMV results in protection from NK cell lysis and that this phenomenon does not depend on ligation of NK cell inhibitory receptors . However, NK cell activation depends on a balance of both activating and inhibitory receptors [18, 19]. Thus the molecular basis of HCMV-induced protection from NK cell attack could be due to viral modulation of target cell ligands for NK cell activating receptors. The HCMV UL16 glycoprotein has been shown to bind at least some of the ligands for the NK cell activating receptor NKG2D , but its function, if any, during viral infection had not been studied. In order to study whether UL16 plays a role in evading the innate immune system, NK cell recognition of target cells infected with either HCMV (strain AD169) or a UL16-knockout mutant (ΔUL16)  of AD169 was compared. Cytotoxicity assays were performed using as effector cells NK cell lines from multiple healthy donors and as target cells two lines of human fibroblasts, HFFF2 and Hs27. The result of one representative experiment is shown in Figure 1. This experiment showed that cells infected with the virus lacking UL16 gene were killed more efficiently than cells infected with the unmodified AD169 virus, and that expression of the UL16 glycoprotein resulted in a marked decrease of the susceptibility of HCMV infected fibroblasts to NK cell attack. The majority of the experiments were done 36–48 hrs after infection with HCMV, since significant levels of UL16 are first detected at this time . However UL16-dependent HCMV-induced protection from NK cell lysis could also be demonstrated 72 hours post-infection (data not shown). In brief, specific inactivation of the UL16 gene led to a loss of resistance of the infected target to NK cell mediated destruction, implying that expression of the UL16 glycoprotein constitutes a significant mechanism by which HCMV-infected cells evade recognition by NK cells. UL16 protects HCMV infected fibroblasts from NK cell cytotoxicity. Hs27 fibroblasts were mock infected or infected with either the laboratory strain of CMV, AD169, or with the same strain of virus lacking UL16, ΔUL16. 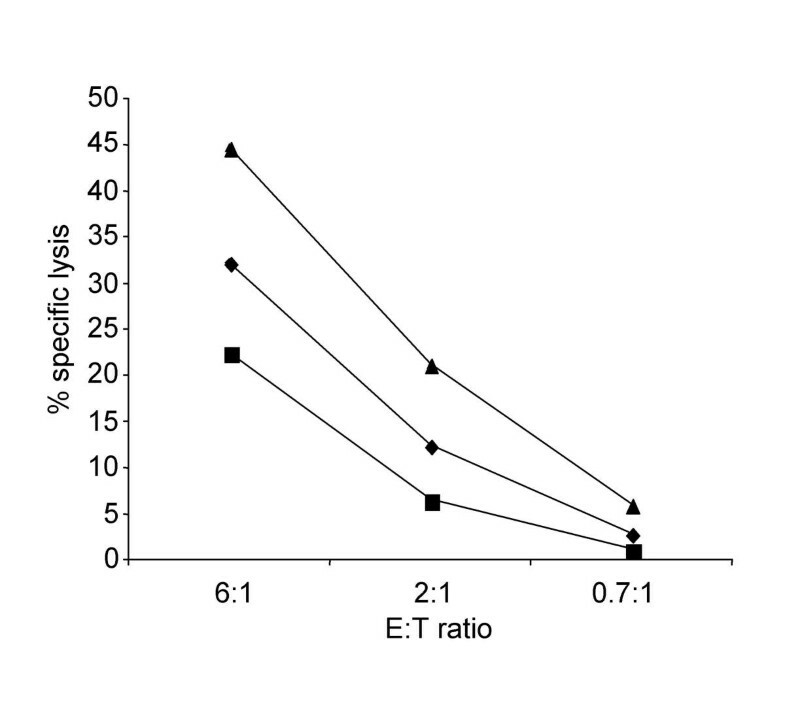 48 hours after infection, these cells were used as targets in cytotoxicity assays (see methods) at the E:T ratios indicated. The percentage of specific lysis is depicted. This result is representative of six experiments using in each one, as targets, the two lines of human fibroblasts HFFF2 and Hs27. In the different experiments NK cell lines from different donors were used as effectors. Diamonds - uninfected cells, squares - HCMV infected cells, triangles - ΔUL16 infected cells. To explore this phenomenon in more detail, fibroblasts infected with either AD169 or ΔUL16 were tested in cytotoxicity assays for recognition by a panel of NK cell clones. Representative data from these experiments are summarised in Table 1. The main observation from this analysis is that UL16 plays an important role in HCMV evasion from NK cell attack, since in almost every case, ΔUL16 infected cells were much more susceptible to NK cell lysis than AD169 infected targets. However, these experiments also provide evidence that, for a minority of NK clones, other non-UL16-dependent mechanisms that protect the virus-infected cell from NK lysis can be detected. For example, two (out of 15) NK clones (A5 and B6), failed to kill both AD169 and ΔUL16 infected cells. This behaviour could depend on the differential expression of a certain ligand in the target cell, as clone A5 shows different patterns of cytotoxicity with the two targets shown. This hypothesis is entirely consistent with the known heterogeneity and redundancy of receptor expression observed in NK cell populations. The mechanisms used by these clones to stop killing of the infected cell could be dependent on the expression of the UL18 and/or UL40 gene products [8–10, 20], although others have either failed to show an inhibitory effect of these proteins on NK cell recognition [12–14, 16] or have demonstrated an effect only in the late phase of the viral life cycle . Alternatively, there may exist other, as yet undefined viral proteins that can confer a measure of protection from NK cell lysis. In any case, the effects due to the mechanisms not dependent on UL16 were seen with only a minority of clones. Other clones killed mock-infected cells only slightly more than ΔUL16 infected targets (two clones with the pattern of D6), as if the NK cell was ignoring that the target was infected by a virus. This implies that, in this particular case, a receptor-ligand interaction that would usually lead to strong activation of the NK clone is now missing. Interestingly, in a few cases HCMV infection did not lead to protection, but rather appeared to stimulate of NK cell cytotoxicity, although again removal of the UL16 gene from the virus enhanced recognition of the virus-infected cell by that clone (clones F10 and A8). This could represent the action of an activating receptor-ligand interaction. An alternative, not exclusive, explanation for the behaviour of these clones could be that, a negative signal generated when the NK cell encountered the non infected fibroblast, such as a KIR-mediated protection, could be lost in the virus-infected cell. The latter explanation is plausible in the case of clones A8, F10 and D9, which behaved following the cytotoxicity pattern expected from the KIR phenotype determined from flow cytometry and redirected lysis experiments (data not shown). In summary, the analysis of recognition of HCMV infected cells by NK lines and clones clearly shows that expression of the UL16 gene product results in a reduced susceptibility of the HCMV infected cell to NK attack. Also, although this mechanism of protection seems to dominantly affect the majority of the NK clones, it is used in combination with others within the virus-infected cell, presumably to allow the virus to escape from a larger population of NK cells. Having defined that UL16 expression was associated with protection of the infected cell from NK cell attack, the obvious next step was to study the mechanism by which this effect was achieved. Soluble UL16 protein has been shown to bind, in vitro, the MHC class I related molecules MICB and ULBPs 1 and 2, also ligands of the NK cell activating receptor NKG2D. In the same study, soluble UL16 was found to be able to compete with soluble NKG2D for binding to MICB and ULBPs expressed in the surface of transfected cells . The simplest hypothesis to explain the data from the killing assays described above was therefore that the UL16 glycoprotein was interfering with the interaction of the NKG2D receptor with its ligands, thus blocking NK cell activation. To test this hypothesis, uninfected fibroblasts as well as fibroblasts infected with AD169 or ΔUL16 were stained with an NKG2D-Ig fusion protein and analysed by flow cytometry. As controls, the various target cells were also stained with antibodies to LFA-3 and HLA class I, since infection with HCMV has been shown to induce changes in cell surface expression of molecules such as LFA-3  and down-regulation of HLA class I molecule expression  and these changes could contribute to the different susceptibility to NK lysis of cells infected with different viruses. The results of these experiments are shown in Figures 2 and 3. LFA-3 and MHC staining in cells infected by CMV wild type and CMV lacking UL16. 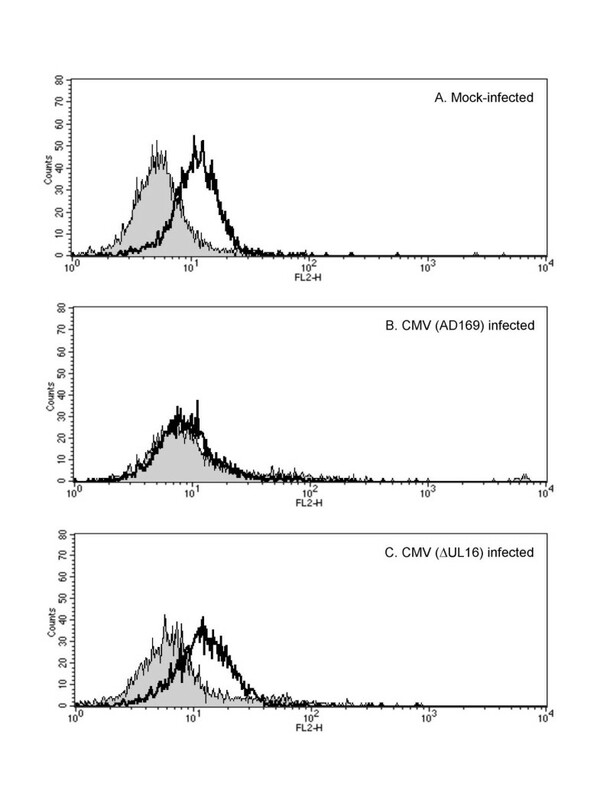 Hs27 fibroblasts were either mock-infected (filled histograms) or infected with the laboratory strain of CMV AD169 (dotted line) and with the same strain of virus lacking UL16, ΔUL16 (solid line). 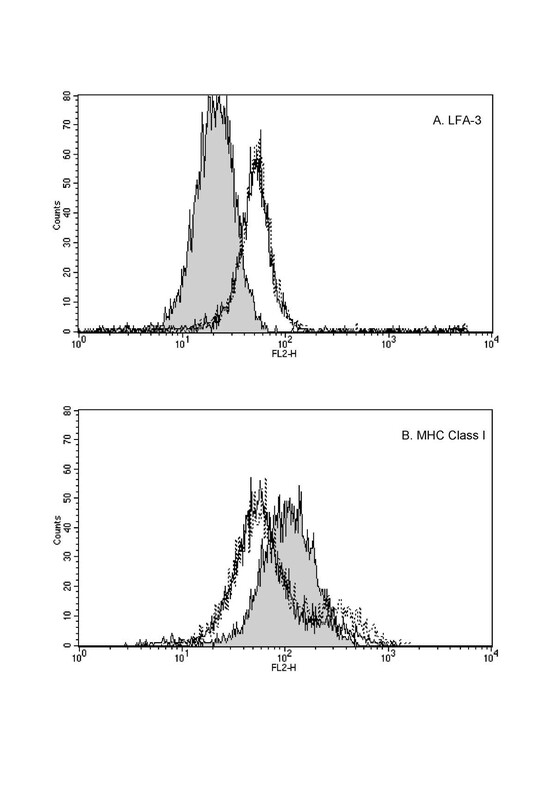 Cells were stained for LFA-3 (A) and for MHC class I (B) and analysed on flow cytometry. LFA-3 was up-regulated in CMV infected cells to the same level, whether UL16 was present or not, compared to mock infected cells. At the same time, MHC class I became down-regulated in both CMV wild type and ΔUL16CMV infected cells in a comparable manner. Data are representative of several experiments and results obtained using both human fibroblast cell lines Hs27 and HFFF2 were comparable. The presence of UL16 affects the surface expression of an NKG2D ligand in the context of CMV infection. HFFF2 fibroblasts were either mock infected (A) or infected with the laboratory strain of CMV AD169 (B) and with the knock out virus lacking UL16 gene, ΔUL16 (C). Cells were stained using NKG2D-Ig protein (solid line) or control human IgG1 (filled histograms) and analysed using flow cytometry. Surface expression of NKG2D ligands was much reduced in the CMV infected cells and recovered in the absence of UL16. Data are representative of several experiments and results obtained using both human fibroblast cell lines Hs27 and HFFF2 were comparable. These data confirm that HCMV infection leads to an increase in cell surface expression of LFA-3 and a decrease in expression of HLA class I molecules. However, the AD169 and ΔUL16 viruses behaved identically with regard to alterations in surface expression of these molecules, either at 2 days (as shown in Figure 2), or at 3 days (not shown), post-infection. On the other hand, differences in cell surface expression of ligands for the NKG2D receptor could be detected between cells infected with AD169 and the ΔUL16 viruses. In our experiments, both lines of fibroblasts, HFFF2 and Hs27, expressed a ligand(s) for NKG2D, as previously reported . Strikingly, staining with NKG2D-Ig was maintained in cells infected with ΔUL16 but was much reduced when the fibroblasts were infected with the wild type virus (Figure 3). This evidence is consistent with the hypothesis that UL16 interferes with NKG2D-mediated NK cell activation by sequestering, internalising or covering a ligand, or ligands, of NKG2D. The FACS experiments imply that the interaction of the NKG2D receptor with its ligands is a major signal driving the activation of NK cell cytotoxicity against HCMV infected cells. However, it is also apparent that it is not the only signal influencing the behaviour of the effector. Infection with both HCMV and ΔUL16 led to a decreased expression of MHC class I proteins and an increased expression of LFA-3 molecules (compared to uninfected cells), both changes expected to conduct to an increased susceptibility to NK lysis. In addition, infection with wild-type HCMV also produced a marked reduction in NKG2D ligand expression, and the net effect of these changes was protection from lysis. In contrast, ΔUL16 infected cells were much more susceptible to lysis by NK cells than uninfected cells, but expressed roughly comparable levels of NKG2D ligands. The difference in killing in these cases is presumably influenced by the changes in MHC and LFA-3 expression. These data emphasise once again that NK cell activation depends on a delicate balance of positive and negative signals produced by the engagement of numerous activating and inhibitory receptors with their ligands and that it is changes in the balance of these signals which determine the behaviour of the NK cell [18, 19]. We have not observed any evidence of upregulation of MICA and MICB on HCMV infection described by Groh et al . We have no simple explanation for this discrepancy, but suggest that it probably reflects some differences in the strains of AD169 used in the different sets of experiments. Groh et al used AD169 from the ATCC, whereas in our experiments we used a separately maintained "UK" AD169 strain as this was the parental strain used in the process of construction of the UL16 knockout virus and is the sequenced isolate of HCMV . Virus variation on passage is a well recognised phenomenon and in this specific instance there is independent evidence documenting significant differences between the AD169var ATCC and AD169var UK viruses . The above data clearly demonstrated that UL16 expression is necessary for HCMV-mediated down-regulation of NKG2D ligands, but they did not address whether UL16 produced this effect on its own or in association with other viral products. In order to investigate whether expression of UL16, outside of the context of the rest of the HCMV genome, would reproduce the phenotype of the modified ΔUL16 virus, a transfectant cell line expressing the MICB molecule, a known ligand of both NKG2D and UL16, was generated and infected with a panel of vaccinia viruses including a recombinant vaccinia expressing UL16. Since cells infected with vaccinia virus become highly susceptible to NK cell attack, an effect which does not depend on interactions involving the upregulation of MIC proteins (S. Chisholm and HTR, unpublished observations), it was not possible to test the infected transfectant in cytotoxicity assays. Instead, cell surface expression of MICB, after overnight vaccinia infection, was tested by flow cytometry (Figure 4). 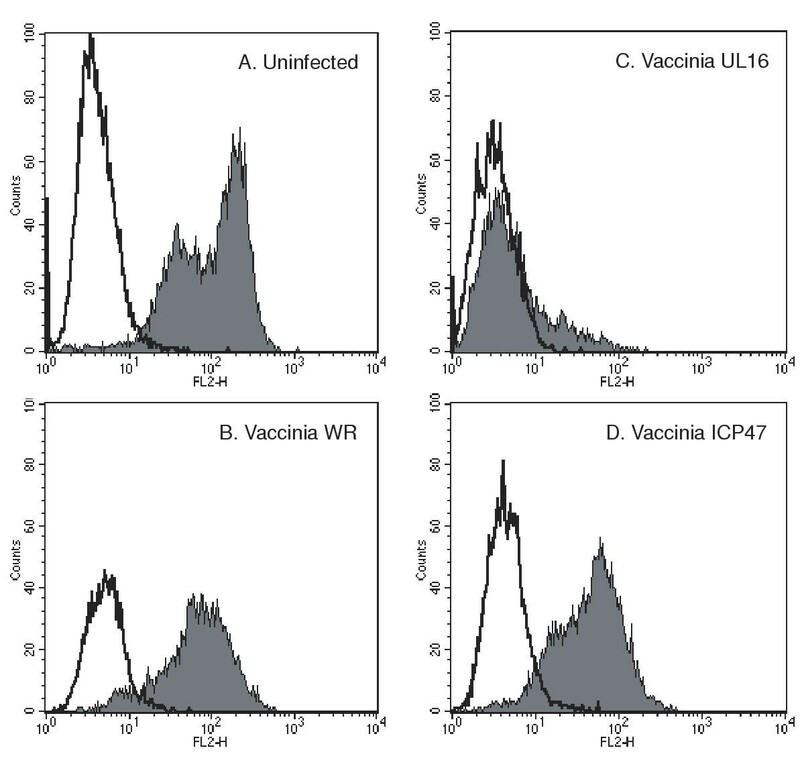 Infection with vaccinia UL16, but not vaccinia WR or a recombinant vaccinia expressing ICP-47, led to an almost complete loss of cell surface expression of MICB, complementing and confirming the data obtained by study of the UL16 knockout HCMV. Thus UL16 is necessary and sufficient for MICB down-regulation. Further, these data strongly argue that the phenotype of ΔUL16 depends on the deletion of the UL16 gene and not on some adventitious mutation selected for during the construction of the recombinant virus. The expression of UL16 is sufficient to affect the surface expression of MICB, an NKG2D ligand. CV1-MICB cells (see methods), either uninfected (A) or infected with vaccinia WR (B), vaccinia UL16 (C) or vaccinia ICP47 (D). Cells were stained with either human Ig (solid line) or NKG2D-Ig protein (filled histogram) and analysed by flow cytometry. Surface expression of MICB is lost in the presence of UL16. In order to eliminate the possibility that the phenotype of the knockout virus depended on an effect of inactivation of the UL16 gene on the transcription of flanking genes, we studied the expression of UL18 protein in the knock out virus, as the UL18 gene is located adjacent to UL16 . Lysates of cells infected with AD169 and ΔUL16 were prepared and the expression of the UL18 gene product was analysed by western blot assay. Fibroblasts infected with both strains of virus (wild type and knock out) produced similar amounts of UL18 protein (data not shown). The data presented in this paper demonstrate that HCMV has acquired during its evolution the ability to evade NK cell immune surveillance and that this ability depends, in large part, on expression of the viral glycoprotein UL16, which affects the surface expression of NKG2D ligands. We could demonstrate that one of these ligands, MICB, is almost completely lost from the cell surface when the UL16 gene product is present. MICB is a surface protein, whose expression is upregulated under conditions of cell stress , and that can activate NK cells through binding of NKG2D. UL16, by modulating cell surface expression of molecules like MICB, could be therefore helping HCMV to evade immune recognition of the infected cell by disabling a stress-induced signalling pathway. It is interesting to note that MCMV also encodes a protein, gp40 (the protein product of the m152 gene), which acts to inhibit target cell expression of ligands for the NKG2D receptor . The fact that both HCMV and MCMV, viruses that have been evolving independently for more than 20 million years, have acquired during their evolution a mechanism to interfere with immune surveillance dependent on NKG2D mediated signalling argues that NK cell attack has been a strong selective pressure on these cytomegaloviruses. However, it is important to note that although HCMV UL16 and MCMV gp40 appear to have analogous functions they are structurally entirely unrelated, and thus, it is likely that the mechanisms by which they interfere with NKG2D ligand expression will be distinct. Plausible hypotheses for the mechanism by which the UL16 protein interferes with the expression of NKG2D ligands include intracellular association of the viral protein with its cellular targets with either subsequent retention or destruction of the NKG2D ligand molecules. Alternatively, UL16 might associate with the ligands for NKG2D at the cell surface. Here it could passively block the binding of the NKG2D receptor, or it could promote the removal of these molecules from the cell surface either by internalisation or shedding of the NKG2D ligands. At present there is no real reason to favour any one of these possibilities over the others although it has been reported that UL16 can be expressed at the cell surface . In summary, these data provide confirmation of the proposed in vivo function of the UL16 protein . This provides an important clue as to the evolutionary significance of this protein, but it is possible that UL16 has additional functions important in modulating the sensitivity of the target cell to NK cell attack. The human foreskin fibroblast cell lines (HFFs) Hs27 (HLA-Cw7 homozygous, ie. inhibited by NK2 effectors) and HFFF2 (HLACw2, -Cw4, ie. inhibited by NK1 effectors) were obtained from the ECACC and maintained in DMEM/10% FCS. NK cell lines were prepared from healthy adult donors as previously described . NK clones were generated by limiting dilution culture as described previously . The KIR phenotype of some of these NK cell lines and clones was analysed by FACS staining and in redirected lysis experiments, using the monoclonal antibodies EB6 and GL183 (Serotec, Kidlington, Oxford). For example, clones in Table 1 were as follows: A5 KIR1- KIR2-, A8 KIR2+, C6 KAR2+, D6 KIR1- KIR2-, D9 KIR1+ KIR2+, F10 KIR1+. CV1 cells were transfected with a MICB cDNA  (a kind gift of Dr. S. Bahram, INSERM-CreS, Strasbourg, France) inserted as an Eco RI fragment into the vector pBJNeo . Populations of cells expressing MICB were FACS sorted and maintained in DME, 10% FCS with 1 mg/ml G418. Anti-HLA class I antibody, HP-1F7 , was a gift from Dr. M. López-Botet (Universitat Pompeu Fabra, CEXS, Barcelona, Spain). Antibody to CD58 was purchased from BD Pharmingen. Isotype control mouse monoclonal antibodies were purchased from Sigma. The purified human IgG1 used as a negative control for the NKG2D-Ig staining was purchased from Serotec. The Human Cytomegalovirus (HCMV) strains used in these experiments were AD169 and a recombinant derivative in which the UL16 sequence was disrupted by a lacZ expression cassette . Stocks of these viruses were prepared and titred on MRC5 cells. For infection of HFFs an MOI of 5 was used and a 95–100% cytopathic effect, as determined by microscopic inspection, was observed by day 2 post infection. Recombinant vaccinia viruses expressing UL16  and ICP-47  (a kind gift of Prof. B.T. Rouse, Dept. of Microbiology, University of Tenessee) have already been described. Vaccinia strain WR  was a gift from Dr. A. Alcami (Dept. of Medicine, University of Cambridge). Vaccinia viruses were propagated and titred in BS-C-1 cells. For the FACS experiments, CV1-MICB transfectants were infected with the various vaccinia viruses at an MOI of 10 and analysed for cell surface expression of MICB 12–16 hrs post-infection. The NKG2D-Ig fusion protein contains the extracellular portion of the NKG2D molecule fused, in frame, to the COOH terminus of an N-terminally truncated human IgG1 heavy chain gene  subcloned into the mammalian expression vector pcDNA3 (Invitrogen). The sequence of the oligonucleotides used to amplify NKG2D were 5'-CGGGATCCAACTCATTATTCAACCAAGAAGTTC-3' and 5'-GCGTGTCGACTACACAGTCCTTTGCTGCAG-3'. Recombinant protein was produced by transient transfection of 293T cells and purified from the supernatant by affinity chromatography on Protein-G sepharose (Amersham Pharmacia). Integrity of the purified protein was checked by SDS-PAGE analysis. For flow cytometry, 105 cells were preincubated in PBS containing 1% bovine serum albumin (BSA), 0.1% sodium azide (Sigma) and either 10% normal rabbit serum (NRS), for staining with NKG2D-Ig or 10% human serum, for staining with the various mouse mAbs. Cells were stained with 50 μg/ml of NKG2D-Ig protein followed, after washing, by phycoerythrin labelled F(ab')2 fragments of goat anti-human Ig (Coulter). Staining with mouse mAbs was visualised with phycoerythrin labelled F(ab')2 fragments of goat anti-mouse Ig (Dako). Samples were analysed using a FACScan flow cytometer (Becton Dickinson). Infected HFFs were lysed in 0.5 ml of lysis buffer (50 mM Tris, 150 mM NaCl, pH 7.5, 1% NP-40 with protease inhibitors (Leupeptin and Pepstatin A) and centrifuged to pellet nuclei. Lysates were resolved by SDS-PAGE on 12% gels and transferred to Hybond P (Amersham Pharmacia). Western blots were performed using 10C7 anti-UL18 mAb , followed by horseradish peroxidase-conjugated second antibodies (Dako). Blots were visualised using the ECL Plus system (Amersham Pharmacia). The cytolytic activity of NK lines and clones against virus-infected and uninfected target cell lines was assessed in 4-h 51Cr release assays. In these assays, 5 × 103 target cell HFFs were plated in flat-bottomed 96-well microtitre plates at 37°C, allowed to adhere, and then infected with either HCMV strain AD169 or the UL16 knockout virus. After adsorption of the virus for 1–2 h at 37°C, the innoculum was removed and medium containing 10% FCS was added. Mock-infected targets were prepared in parallel. Two days after infection effector cells at various concentrations were added to the infected and mock-infected targets and the assay incubated at 37°C. Assays were performed in triplicate, and data values differed by <10% (on average ~5%) of the mean. In all presented cytotoxicity assays, the spontaneous release of 51Cr was <25% (on average ~10%) of the maximal release. All cytotoxicity assays were performed 6–8 days after restimulation of the NK cells. We would like to thank Dr. A. Alcami, Dr. S. Bahram, Dr. J. Bennink, Dr. M. Lopez-Botet, Prof. B.T. Rouse and Dr. E.G. Routledge for the gift of virus strains, plasmids and antibodies; Prof. A.C. Minson for helpful discussion; S. Chisholm, N. Mavaddat, D. Pozo, S. Williamson, for critical reading of the manuscript. This work was supported by The Wellcome Trust. MVG carried out flow cytometry and western blot experiments, contributed to the cloning and production of recombinant proteins and wrote the manuscript; HB produced the HCMVs and recombinant vaccinia expressing UL16; HTR maintained virus stocks, performed cytotoxicity assays and contributed to molecular cloning and production of the recombinant proteins, conceived and coordinated the study and provided financial support.